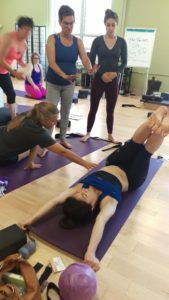 Last week, I discussed my newfound awareness of the core in its entirety at the the Yoga Tune Up® Core Integration Immersion. This week, I’ll discuss how I came to terms with all of the incredible things my core can do for me, and let go of the shame I felt for my belly. Since my very first days practicing yoga, I had appreciated the notion of awareness through various meditative practices involving the breath. I was getting better at sitting or lying down and focusing on the in and out of my breath. But the core immersion took me to a new and unexpected place. I don’t believe that before the core immersion, I had actually been aware of my spine. I knew in general that the core was not one thing, but many things, I knew, intellectually at least, that it was composed of the entire mid-range set of muscles that surrounded my core like a cumberbund: the rectus abdominis, of course, but also, the transverse abdominis, and the internal and external obliques. But my spine, awareness of my spine? That was something I had never, ever contemplated. I somehow thought that this circular band of muscles woven through and hydrated by our precious fascia was all that was necessary to support the spine. After each series of breath-filled movement, we lay on our backs and “checked–in.” Encouraged to notice my spine, I now felt the lumber curve as more curvy and more alive. My thoracic spine, surrounded by my upper back, spread deliciously onto the mat with more assurance and my cervical spine, or neck region seemed more relaxed. And my lower, front ribs seemed to relax down as well. Breathe. Check in. Stabilize. Repeat! Each day of the immersion began with an exploratory class that surprised and delighted. We found our innermost abdominals by resting our bellies on the Coregeous® ball. But we also used The Roll Model® Therapy Balls to release intercostal tension and to mobilize rib joints, which would improve our breathing mechanics. We did leg lifts on blocks with arms outstretched to lengthen, strengthen, and connect our breath with the central chassis of the spine. Lying on our sides we used the “Magician’s Assistant on a Ledge,” to strengthen and lengthen deep lateral stabilizers like the quadratus lumborum. Throughout all of this 360-degree movement that both lengthened and strengthened, I learned that the diaphragm was the body’s MVP. Perhaps my biggest Aha! 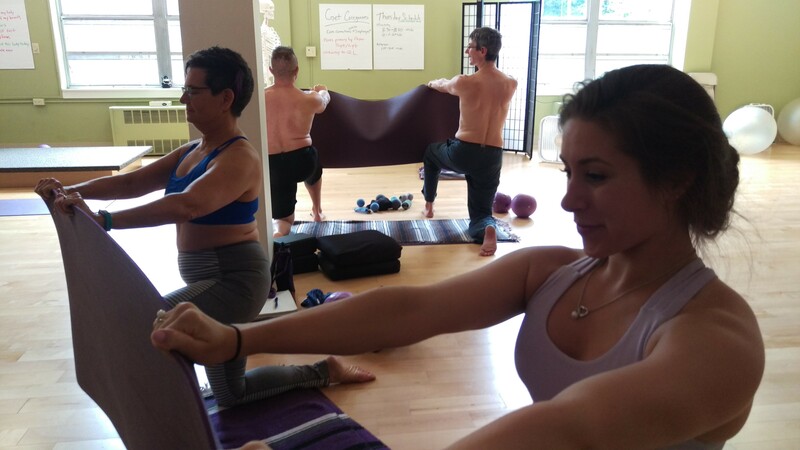 moment in the core immersion was that I could use my breath as a mobility tool. Certainly muscles stabilized the spine. I knew that, at least at some basic level, when I entered the immersion. But leaving the immersion with this new, very big idea about the breath and the function of the diaphragm was really a game changer for me personally and for how I design my Yoga Tune Up® classes. We laid on the floor – all of us on our bellies – looking down at an illustration of the diaphragm in our well-worn anatomy book, the Trail Guide to the Body and then we looked up at the much used skeleton, draped with multi-colored elasta-bands. We could see, now, how stabilizing the core happened from the inside, specifically inside the ribs, with the movement of the diaphragm. The diaphragm was not simply a mechanism designed for breathing. But I didn’t really understand the impact of the sweater of connective tissue that envelops all of our muscles, ligaments, and tendons called fascia. The fascial connections between the diaphragm, the pelvic floor, and the entire rest of the body create a functional unity in our bodies. Our fascia, as Jill Miller defines it, is “the ubiquitous seam system in your body that threads your tissues to one or another” (p. 97, The Roll Model). Fascial tissue offers a “highway” that connects structures, protects and repairs tissue damage, and relays information to your brain through a process called proprioception. With greater fascial fluidity comes greater proprioception – your ability to identify where you are in space. And, with greater proprioception your perception of pain decreases. The experience of watching my breath, studying the illustrated diaphragm in the Trail Guide, and seeing a folded Coregeous® ball held inside the skeleton’s ribs with colored ribbons of stretchy rubber created a “new normal” for me.. The diaphragm, attached to the six lowest ribs and the upper two or three lumbar vertebrae, and also attached to the xiphoid process on the sternum, now looks like the control center – the place behind the curtain where the Wizard of Oz worked his magic. Finally, my “too-large” belly was not the point. It was a body blind spot with little proprioception. Understanding and seeing how my spine was stabilized and mobilized by the diaphragm and all its attachments created a much larger road map for me. My proprioception – my ability to feel and see my body in space – had shifted momentously. The isolated numbness I saw as my belly now had permission to feel from the inside out. Pelvis to shoulders, your core creates stability. Over the course of this four and a half day journey, my belly-obsessed thoughts took a back seat as I felt more, strengthened more, and lengthened more, all from the inside out. Only as I look back, can I see that I was gently, but surely, healing a persistent disconnect that treated my belly as a distinct body part and not part of an integrated whole. Many of my yoga students have the same disconnect. They come to me and point to their bellies and say, “I need to do core work.” And now, after this immersion, I have a richer, more complex understanding of what their needs are and how to respond in my classes and my workshops. More than “core work,” it takes courage to redesign what was a shameful body part as a launching pad for your whole and much-loved self. This is the message I take home from the core immersion and the message I hope to bring to my students. My eye felt on the title of this article: like other readers I recognise the same… my belly is also a part of my body where I look at in a way of “not being so proud of”… how wonderfull it is after the Core Immersion you can look at this part of your body as a friend and appreciate it for what it is and does for your body! Surely your article has made me enthousiastic about taking part in this Immersion, thank you! So inspiring! Would be great to communicate to larger populations, including post partum mommas. “my “too-large” belly was not the point. It was a body blind spot with little proprioception” love it. It is great way to empower the students to roll with the corgeous ball. Use the diaphragm to help to find the relationship with the spine. I have always had a difficult relationship with my belly. Even before I had my son! I completely understand how amazing it is to begin to change our perspective and realize that the belly or core muscles are really important for stability! So this area on my body that I hide and judge, it’s actually holding me up and supporting me like a non judgemental friend! Pretty amazing and even healing! Thanks for sharing your journey! We tend to think of the core as isolated in terms of exercise and anatomy. I really love the reminder of how interconnected the body is especially the core. It’s also amazing the ability to learn about the body to eliminate body shame. The connection with the mental, the shaming, the discovery, the self-acceptance and the self connection. Thank you for sharing this inspiring article. I’m hoping to participate in a Core Immersion training if I can find one close enough to home. AnnMerle, I have thoroughly enjoy reading your blogs about the core immersion. I wanted to take it before, but now I REALLY want to take it….to learn the technical aspects of the core which you so eloquently summed up above and equally important: the self of love the core. Thanks for another great blog read! I loved so many things about this post. I think so many women can relate to the belly as a source of shame and something that “needs work”…I know that I certainly can. Breaking down the mechanics of the core, starting with “the body’s MVP” makes so much sense if we want to change our relationships with our bellies. I also love the analogy of fascia as a sweater – what a visual! Thank you for sharing your experience, I look forward to attending a core immersion training later this year and deepening my understanding of the connection of fascia, proprioception and perception of pain. Thank you for an inspirational text. Im still working on the core concept (body being interestingly slow to respond) but i loved your words on really stabilizing the spine from the inside out with the diaphragm. The core immersion was a revelation for me. I realize that knowing something and integrate it is two differents things. Since then I move more consciously trought my day. AnnMerle – what a beautiful path you have shared here! Thank you!!! I am currently in the YTU Level 1 course and my understanding of fascia has deepened a great deal! It’s important to always be open to learning and to feeling. The therapy balls are wonderful tools for taking us on the profound journey! Thanks for this inspiring article. I think it’s so important to encourage people to connect with, explore and feel empowered to heal an area like the core. For so many, it’s a place of shame, embarrassment, vulnerability or neglect. It can take a lot of trust for someone to receive therapeutic touch in the form of massage or manual therapy, which is why the Yoga Tune Up work is so great, because it empowers and allows a person to move at their own pace and hopefully feel less guarded and more open to release. Like everyone else I loved your article as a 54year old mom it is empowering to read about your experience.i an in my 6th day of the level one certification and had been thinking about doing the core immersion now I know that I will for sure.i agree the teachers are wonderful. Great blog post – thanks for the detail – like Sabrina, I too am inspired to attend a core immersion! There is SO much going on in the center of our being and everything is more interconnected than we think. I love the description of the “sweater” of fascia! WOW! After reading your share I feel compelled to take the core immersion. What an amazingly empowering experience?!!? A struggle that so many people go through- the challenge to accept & love ourselves as we are… thank you for sharing this experience- thank you for giving me hope that these feelings that we all feel can be “outgrown” & shed. Know that you’ve spoken to a deep seed within me & have inspired me. Very informative and inspirational. Thank you! This post makes me so excited to attend the Core Immersion next week! As a teacher who teaches a weekly core class, I feel like I have a pretty good understanding of this region of my body but I am always open to learning more! Good follow up (: I would also like a core immersion experience. 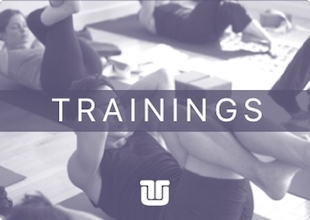 It seems like a great aspect of these classes, to physically connect in a way that mindfully gets through to your emotional self. Thank you again for posting. Great article – and so true how we beat ourselves up mentally, emotionally and sometimes physically to reach some “external ideal” and it is wonderful when we can find that beauty and strength from the inside out. After reading this, I am even more motivated to attend the Core Immersion training – I missed it the last time it was offered locally. Thank you for sharing your perspective and experience! Love this! Inspirational and informative. I like the way you felt your fears fade as the training progressed and moved on to allow yourself to move from seeing your belly in a shameful to realizing power and strength is there for us all. We just have to have the courage to believe in ourselves. Terrific article! Thanks for your insights and inspirational thoughts. Loved this… and I really want to attend Core Immersion after reading your article! Cannot wait to do this class in March. So much to learn. Thank you for your insight. AnnMerle! This is so beautiful. I loved this. As women, we focus, often times negatively, on our “bellies” rather than our core as a whole and for a lot of us, it’s a place of insecurity, something to hide rather than a place of power, stability and grounding. This is something I continue to work on. Sending you love and hugs! Thank you for this article. After reading it I feel like I may need to attend a core immersion. Everything you have said about feeling a discontent with the belly, and obsessing about it’s “largeness” resonates with me. I yearn for the ability to love it, and find strength from it …… can it be?! Imagine: that my belly can be a source of pride for me, not a source of constant frustration. I teach a “core” class every week, and OH how powerful it would be to pass this knowledge and compassion on to my belly-obsessed students! Always a great read AnnMerle! !